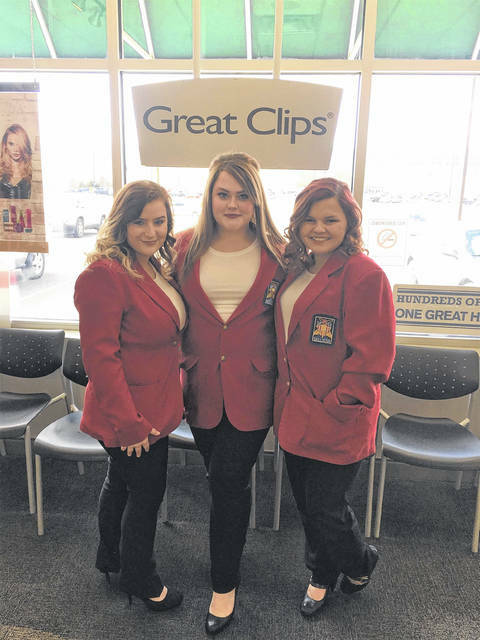 Brooklynn Kazee, Alysa McCallister, and Donna Mersiel, from the SCCTC, in their red jackets they will wear at the competition in Columbus. These three girls, Donna Mersiel, Brooke Kazee, and Alysa McCallister are ready for their walk that they set-up for this Saturday. Three students from the (SCCTC) Scioto County Career and Technical Center have put together a project that they have put their heart and soul into, as prepare for State Competition. They are Skills Career Pathway students and their project is for the Skills USA Competition in Columbus at the Convention Center on April 16th. 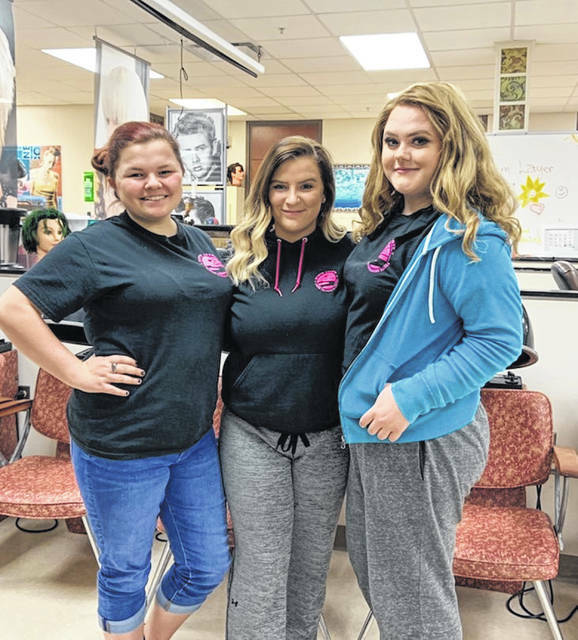 Brooklynn Kazee, Alysa McCallister, and Donna Mersiel, two seniors and one junior from the Cosmetology program, brainstormed together with their instructor, Angee Commeans to come up with what they want and hope to be a state competition winner this year. Both Mersiel and McCallister went to the competition last year as juniors and did fairly well, they received a bronze medal, but felt that they were out of their element, for a project, because they had focused on hair as their project and others had so many other creative projects, that they wanted to spread their wings and do one more like the others who had won. These students, like the ones highlighted in yesterday’s Daily Times, will be at the same competition, but in a different category. In their category, they have to do a live presentation with a time limit. The connection in both projects, was that the students in the American Spirit Contest, used the human trafficking project in their notebook. This group have even set-up their own walk for their project set to be on this Saturday. The students, along with Commeans, have planned for this weekend, ‘A Walk for Freedom’ (Against Human Trafficking). The Event is Saturday from 10:00 a.m. to 12:00 p.m. at Third and Market Street, at the Community Action in Portsmouth. There will be live music featuring Advocate and Yazz, Inflatables, T-Shirts $15.00 Bracelets $2.00 and Refreshments. Tickets cost $10 (or ticket and shirt $20). Tickets are located at Scioto County Career and Technical Center or contact Commeans (740) 353-7376. All of the proceeds are going to The Coalition Against Human Trafficking. Commeans says, “When we went to the domestic women’s shelter, we donated some things for them, curling irons and some hair things.” At the time they went, they had two women and six children there and they talked to the girls about their situations. This group of students have already been on the radio and are to speak at an Alcohol Drug Addition and Mental Health Services Board (ADAMHS)meeting Thursday, April 4th, to promote their project and especially their walk. These girls even have a Facebook page. Kazee says, “We went to schools to speak about Human Trafficking, we spoke at West High School and we gave them a presentation Against Human Trafficking. We went to local salons and gave them flyers that they are supposed to have of Human Trafficking we to nail salons, Cosmetology State Board and it had all the hotlines you could call.” These girls even have a Facebook page. The students say when they get to the competition, they will have a bulletin board, a powerpoint presentation, a demonstration, that they all three will present together. They have exactly eight minutes to present everything they have, and they will practice this before they go to the competition. Both Mersiel and McCallister say they feel they have a way better presentation and that they are way more prepared. Mersiel says, “We’ve done a lot more in the community this year.” Kazee, as a junior, has added a lot to the project this year too, the others say. If they would happen to do well at State, they would go to Nationals, which is in Louisville, Kentucky in June. There are usually 23 to 26 vocational schools that compete at the state competition. They also have to compete against any human services groups. This project these three young ladies have prepared, has taken a lot of time and great effort and these girls should be commended for their hard work well done and hopefully success will be with them on the 16th. Lots of luck to both groups that will be representing the SCCTC and our community.